With all the gadgets you have to carry with you on vacation—cellphone, camera, camcorder, laptop, PDA, GPS—worrying about where you placed that SD the last thing you want to think about. 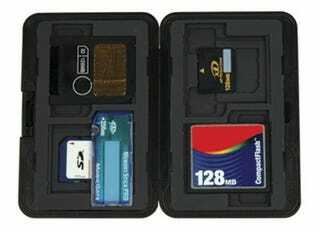 Now you can place them all in one secure location, the Memory Card Travel Case, to make sure they're not lost or damaged in transit. The case holds "CompactFlash I/II, MD, SM, MMC, SD, miniSD, MS, MS Prod, MS Duo and xD card" formats. It costs $19.95 and is well worth it if you're as prone to losing cards as we are. Plus, the case actually does protect the cards from droppage, which actually isn't a big deal since we've never damaged a card from dropping it.